I’ve always thought Disney’s portrayal of Pumba in The Lion King is the epitome of a warthog. Working as a field guide I am fortunate enough to see these funny characters on a daily basis. To me they are quite possibly the most comical of Africa’s mammals. Inquisitive in nature, warthogs typically stare at you curiously as you approach them. This is usually followed by a short, loud snort as they turn on their heels and run away with their tails pointing straight up. Forget science for a moment and think of Pumba. It’s as though he suddenly remembers he is late for an appointment and has to dash off. No matter how bad your day, a running warthog will make you smile. 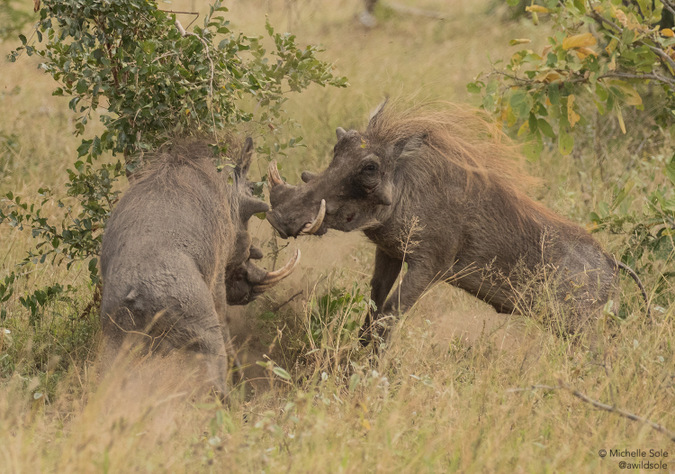 Back to science – despite their cuteness, warthogs are clearly well designed for combat. 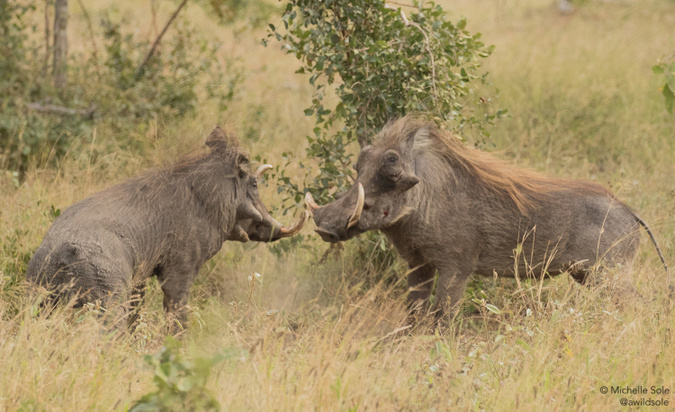 Warthogs are not territorial, but males will fight for mating rights. 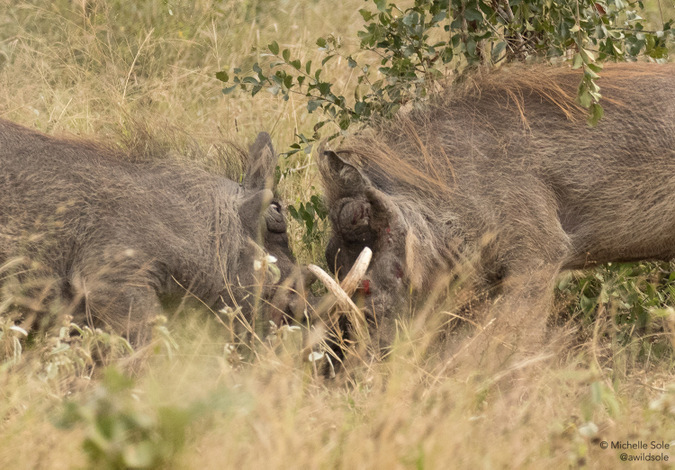 The name warthog comes from the warts found on the face. Sows have one pair of warts whilst boars have a second pair. The second pair of warts are much larger and aid in deflecting enemy tusks whilst fighting, thereby protecting the eyes. 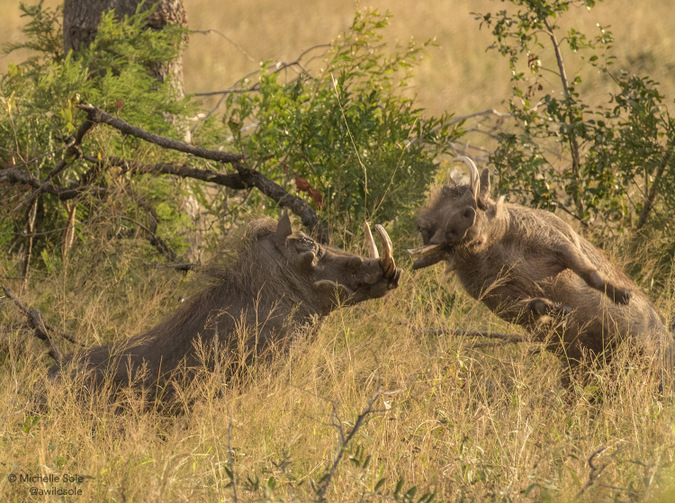 It goes without saying that warthogs use their sharp tusks like swords in battle, but until recently I had never seen these weapons in use. 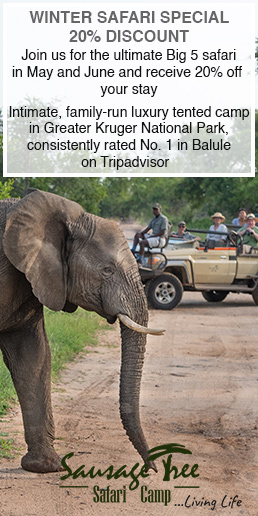 It was late in the afternoon as we left Berg-en-Dal camp in the Kruger National Park. In the distance, two boars knelt on their front legs facing one another. Snout to snout, forehead to forehead. Their muscles tensed and their bulky mass pushed forwards. The smaller of the two was missing his tail. Was this the scar of an earlier battle? Or had he previously had a close encounter with a predator? Whichever it was, he was smaller and I didn’t fancy his chances. We watched in fascinated silence. Every now and then dust would fly into the air as one of the boars flicked up his head in a sideways motion in an attempt to catch his opponent off balance and reach the fleshy underbelly with those deadly tusks. On several occasions the smaller of the two pigs was catapulted upwards and a shrill scream filled the air. These flying lessons didn’t deter the smaller boar. He intermittently jousted back. It was then that we noticed just how sharp one of his tusks was. He may not have had the size or the power, but he was quicker and more agile than the bigger hog. Both boars had blood-covered faces and it looked likely that this duel would not end until one of them was dead. The scene was an oxymoron; extremely difficult to watch but at the same time enthralling. Suddenly there was a break in the wrestle and the larger pig turned on his heel and sprinted away. The smaller, tailless boar was hot on his heels. 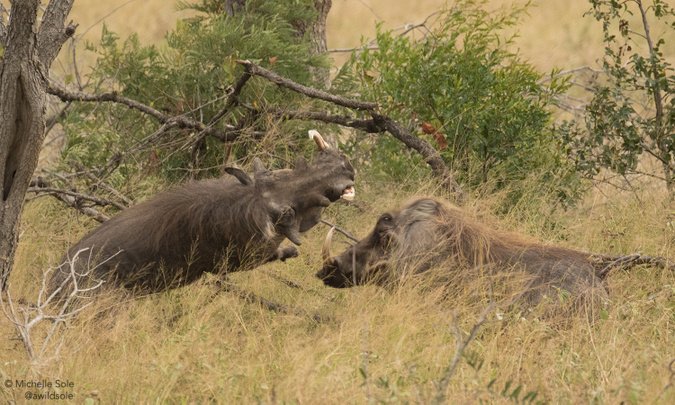 The warthogs quickly covered a surprising amount of ground and from our vantage point we lost sight of the larger hog. The victor returned, tusks dripping with blood and his head held high. 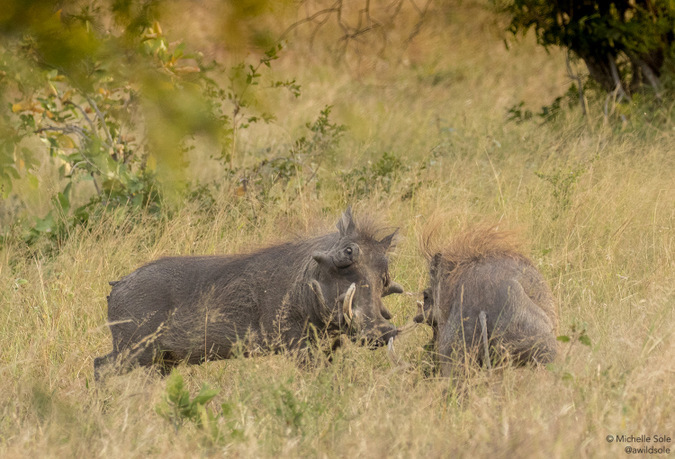 Pumba may well portray one side to the warthog but there is certainly another side to these seemingly friendly pigs that is certainly not to be messed with! Michelle Sole is a safari and polar guide, wildlife photographer and blogger. As a child, Michelle always had a love and respect for nature, animals and the outdoors. She competed for Great Britain as an alpine ski racer for ten years, chasing winters around the world. On a family holiday to Africa in 2008, Michelle fell in love with elephants. 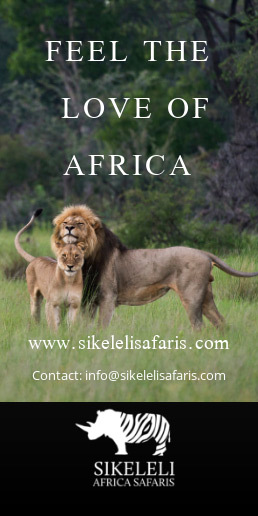 In 2011 she moved to South Africa where she completed her studies to become a field guide and worked for five and a half years in the Waterberg Biosphere in South Africa. In 2017 Michelle spent a year backpacking around the globe, travelling from one national park to another. At the end of the year she spent three months guiding in Antarctica. She now divides her time between the African sun and the Antarctic ice, sharing with guests her passion for whales, birds and photography. Her thrill for adventure, the outdoors and adrenaline are at the core of her photography and writing. Follow her on Facebook or Instagram.